And what's even better? It only cost $3 to make! If you, too, would like to put your small child to work cleaning your hard floors, read the rest to check out the full tutorial. You will need a "onesie" style baby bodysuit of the right size, a car washing mitt, freezer paper, fabric paint and standard painting and sewing supplies like cardboard, paintbushes, thread, a sewing machine, etc. Make sure you wash your body suit before you begin so that it doesn't shrink after you sew and paint it. If you have never done freezer paper stenciling before, it's super easy. Instead of re-creating a tutorial on how to do that, I'm going to send you over to I Am Momma Hear Me Roar to check out her super fabulous video tutorial on how to do a freezer paper stencil. If you're a newbie, go watch her video right now and then come back. Then cut it out so you have a piece of freezer paper that is the same size as a standard sheet of printer paper. Load it into your printer so that the printer prints onto the non-shiny side of the freezer paper. Then print out the words "Cleaning Crew" in a size that will fit across the back of your body suit (measure your bodysuit to get the right size for you). I love the look of this stencil font that makes it look super industrial. I had to print in blue ink because I was out of black....and really it doesn't matter since you're cutting the letter out with an exacto knife anyway. Once you've got your stencil made, iron it on the back. I ironed mine on at a bit of an angle to add to the industrial vibe. Paint over your stencil. I'm using Tulip Soft Fabric Paint so that it doesn't get too crunchy and make hard pokey edges. Don't forget to put a piece of cardboard inside the bodysuit while you are painting it so the paint does not bleed through to the other side. To stabilize the knit fabric of the body suit while we are sewing, we are going to use another piece of freezer paper. If you have another stabilizing material you would prefer to use, you can use that instead. Slide a piece of freezer paper inside the bodysuit so that it is shiny side up and lines up (with overlap) with the area you would like the mitt sewn to. Now we're ready to sew! 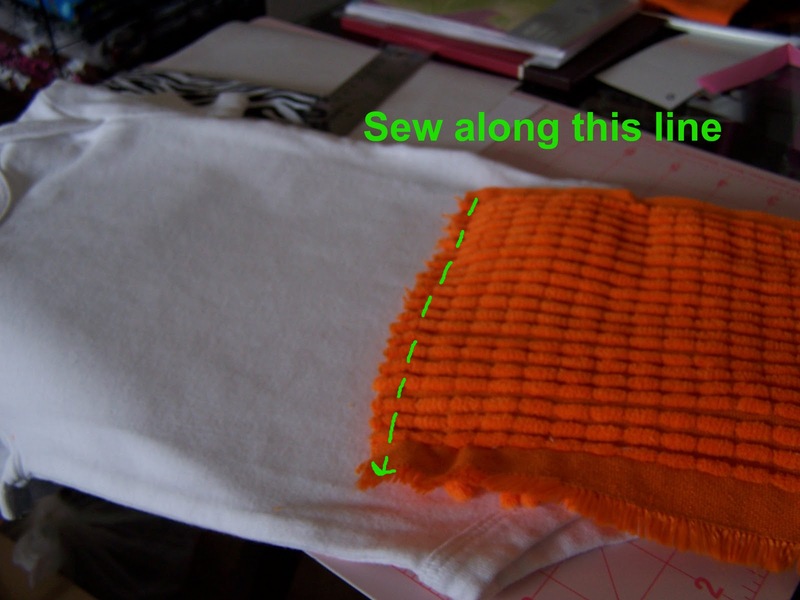 Get your sewing machine ready and loaded with orange (or mitt colored) thread. Lay the mitt down on your prepared bodysuit, being sure to line the mitt up with the area covered in freezer paper. Once you are done, flip the body suit inside out and it will look like this. And that's it! Gear up your newly recruited cleaning crew member and let him go to town helping sweep your hard floor surfaces! update 9/17/2011: I made the top 10 for the Orange week! Thanks for loving my project! Wish I had this when hazy was still crawling! 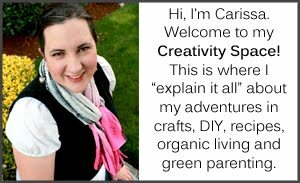 Your creativity is so inspiring! I love you! This is so cute....!!!! I am 15 and still wish my sisters were that little!!! This is so crazy fun! Love! Love! Love this! Hilarious, cute and even practical! Oh and I forgot bargain! SOOOO funny!! I beyond love this. Just so you know, I linked to it from my Facebook Page. This is hilarious! I love it!!!!! That's hilarious, and very cute! We're almost at this stage with bub so I might have to get sewing!